Artist Ryan L Foote who is known for his food art installations, combines his love of chocolate with innovative 3D-printing technologies to create a truly unique range of contemporary chocolates that look more like art then food. Using the latest technologies and combining them with classic chocolatier techniques, Foote has created a range of chocolates that are both visually engaging and reflective of contemporary design. They take culinary inspiration from around the Pacific. “For the last few years I have been working on reinventing the traditional soft centered chocolate for the digital age. There have been some exciting things happening in the bean-to-bar space but I felt the traditional bon bon has remained more or less the same,” shares Foote. Taking inspiration from geological formations, natural minerals and the built world of architecture, Foote has digitally created complex bite size pieces of art. For the last three years Foote has been living between Melbourne and Hong Kong, traveling back and forth for various projects. Chocolates by Ryan L Foote aims to capture the signature flavours of these regions. The collections encapsulate unfamiliar Australian botanicals, traditional Hong Kong inspired flavours, and a range of single origin chocolate from the Asia Pacific region. In the Australian collection expect to find flavours like White Chocolate & Wattleseed, Lemon Myrtle & Macadamia Nut, Chocolate & Mountain Pepperberry and Avocado Smash. The Hong Kong collection offers Egg Tart, Buttery Pineapple Bun, Red Bean Ganache with Salted Coconut. 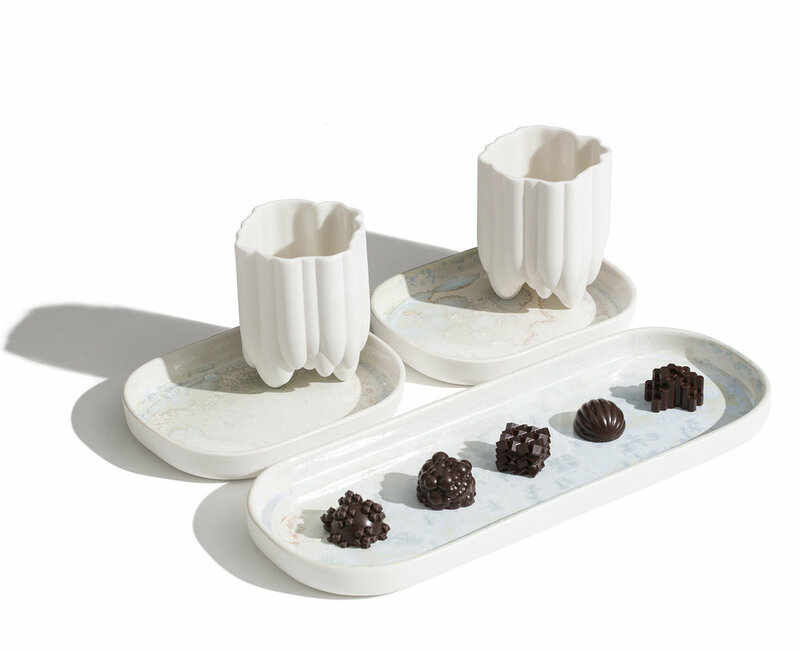 Complementing Foote's signature chocolates is a range of hand-made ceramic pieces, including 3D printed ceramics cups (ideal for drinking chocolate) and plates with unique crystalline glazes that reflect the complex chocolate tempering process. Paired with the chocolates, these pieces make for a truly rarified chocolate experience. Chocolates by Ryan L Foote are currently running a Kickstarter campaign until 18 November, and will release the ranges for Christmas 2018.